Thursday March 3rd 1921 I took a walk on the beach again. Went up to say good-bye to Mrs Miller. I packed up my things, had my dinner and was ready to leave for the depot when Mr Dunlap came for me. I had a comfortable ride to Sebastian. The train was late. I did not get to Fellsmere till after dark. Ida met me. Letters from Laura & Tishie. 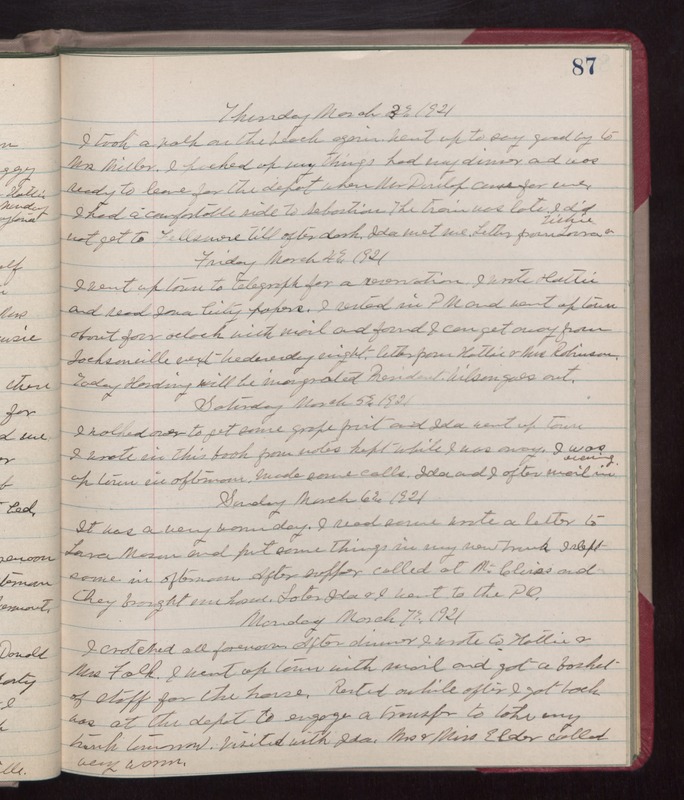 Friday March 4th 1921 I went up town to telegraph for a reservation. I wrote Hattie and read Iowa City papers. I rested in PM and went up town about four oclock with mail and found I can get away from Jacksonville next Wednesday night. Letter from Hattie & Mrs Robinson. Today Harding will be inaugurated, President Wilson goes out. Saturday March 5th 1921 I walked over to get some grape fruit and Ida went up town. I wrote in this book from notes kept while I was a way. I was up town in afternoon. Made some calls. Ida and I after mail in evening. Sunday March 6th 1921 It was a very warm day. I read some, wrote a letter to Laura Mason and put some things in my new truck. I slept some in afternoon. After supper called at [McCluias?] and they brought me home. Later Ida & I went to the PO. Monday March 7th 1921 I crotcheted all forenoon. After dinner I wrote to Hattie & Mrs Falk. I went up town with mail and got a basket of stuff for the house. Rested awhile after I got back. Was at the depot to engage a transfer to take my trunk tomorrow. Visited with Ida. Mr & Mrs Elder called very warm.